Green glazed Buddhist pagoda tile, Kalong, Thailand. 14-16th Century. 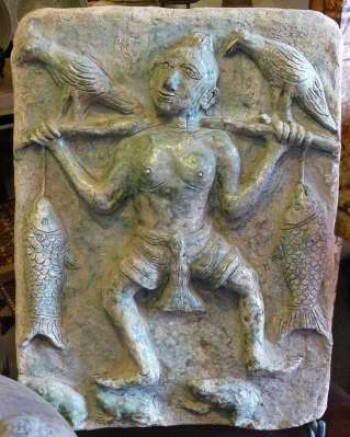 Green glazed earthenware Buddhist pagoda plaque portraying a fisherman holding a burden pole with caught fish, two birds and frogs. From recent excavations in Kalong province, Si Sakhon, Thailand. 14-16th century.